Is Weibo on the way out? China's internet watchdogs have threatened to enforce real-name registration before. But this time, they're adamant all Chinese citizens must provide their real names and identification numbers before using social media sites starting on 1 March. Nicknames can be used on the sites, but only after users hand over their personal details to the government. The new rule will stifle one of the few venues for free speech in China, many fear. Specifically, real-name registration could hasten the slow death of Weibo, China's version of Twitter. Once the only place to find vibrant sources of debate on the Chinese internet, Weibo is quickly losing momentum. Fifty-six million people in China stopped using Weibo accounts last year, according to China's state internet regulator, registering a drop from 331 million accounts to 275 million accounts. Several internet companies operate Weibo services in China, though all function in a similar manner. Those with Weibo accounts don't seem to be using them very much. Ninety-four per cent of the messages on Weibo are generated by just 5% of its users, or 10 million people, according to one study published last April by the University of Hong Kong's Journalism and Media Studies Centre. The same study found that almost 60% of accounts had never posted a message. Part of that decline can be attributed to the rise of WeChat, a mobile messaging platform that allows users to send messages privately to their friends. WeChat's flashy graphics and constantly-evolving menu of services makes Weibo forums seem clunky and dated. WeChat's invitation-only format must also give government censors some relief: if Weibo can be viewed as a concert stadium, allowing any government critic to be heard in front of a large audience, WeChat is like a series of private karaoke rooms, where conversation is limited to a select few. It is much more difficult to gain a following on WeChat than Weibo. 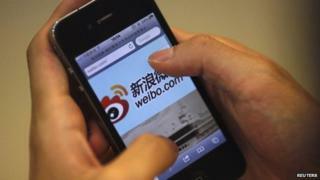 By extension, many attribute Weibo's demise to a scare campaign orchestrated by the Chinese authorities. In 2012, the government issued a long list of rules banning Weibo posts that "threatened national security, reputation or interests". The Weibo accounts of prominent government critics were also closed, igniting a campaign to clamp down on Weibo's most prominent users, known as the "Big Vs". Big V users are verified account holders, usually popular actors, writers or columnists, who attract millions of followers. At one time, it was a badge of honour to hold a Big V account. Now, the Big Vs must watch what they say. Hundreds of them have been detained by police, their accounts policed for comments questioning the government. One Big V, Charles Xue, was arrested for soliciting prostitutes, thought the Chinese state media made it clear that his role as a government critic on Weibo was a key reason he was targeted. "When Xi Jinping took the top job, I think he understood the power of the internet to shape discourse and to influence the populace so he set about making sure that he could keep it all under control," explains Charlie Smith, co-founder of FreeWeibo.com, a website that monitors content that is censored from Weibo. "Getting rid of the Big Vs was likely the killer blow for Weibo and set off a chain reaction of events. By ridding Weibo of these influential voices, from many different parts of society, he effectively silenced a generation that was starting to understand the power of the internet as a communication tool." To be fair, many of the Big Vs still operate on Weibo, though most have veered away from the controversial topics they discussed regularly in the past. One Big V, columnist and writer Wang Xiaoshan, famously used Weibo to demand tighter food safety restrictions and address the imbalance of power between ordinary people in China and the seemingly omnipotent government authorities. "Everybody is talking about the 'Chinese dream'," he mused in 2012. "But I think that in China, to achieve that dream, you have to have a monthly income of 100,000 RMB (£10,000; $16,000) or you must be a government official. Otherwise, you have to immigrate to another country." Now, Mr Wang's comments are much more benign, featuring Hollywood movie reviews and repeated promotions for his online wine shop. Ordinary people have also been warned to tone down their Weibo activity, or make sure it is unremarkable. Users face up to three years in prison if any controversial post they write is viewed more than 5,000 times, or is forwarded more than 500 times. Image caption Could the party be over at Weibo? In one instance, a 16-year-old boy in China's western Gangsu province was arrested after writing on Weibo that "government officials shield one another". The state media made sure to use his case as an example to others. The onset of real-name registration will discourage more people from writing on Weibo. The loss of that forum for self expression is a short-sighted goal, according to FreeWeibo's Charlie Smith. "The authorities are sowing the seeds of discontent. If they continue with these types of crackdowns, and it looks like they will, that discontent will lead to dissent, in some places on the internet, but also in the streets. It's not a sustainable approach," Mr Smith says. It is possible Chinese authorities "believe that as long as people can continue to shop online, all will be okay. If that is what they believe, then they will be surprised when they find that this consumer generation wants to get their hands on things that money can't buy."